"You don't seem happy. I'm just worried about you." A trailer has debuted for a charming new film titled Kushuthara, a rare romantic drama from the tiny Himalayan country Bhutan. Historically, the Bhutanese film industry has looked east for inspiration, modelling itself on the films of Bollywood. Kushuthara is one of the first films to be made in a more western style, with a storyline that draws on Buddhist spirituality. Emrhys Cooper, the first western actor to appear in a Bhutanese film, stars with Kezang Wangmo, and Jamyang Jamtsho Wangchuck (who appeared in Seven Years in Tibet). The dialogue is very cheesy, but I must admit there's a charm to it that makes me want to see it anyway. Plus, I totally love the Himayalas. One single thread, as if lost in the woven cloth, weaves together the story of the past and present lives of two people. Two people, each born on opposite sides of the world, become destined to meet and experience their individual karma and share in its consequences. 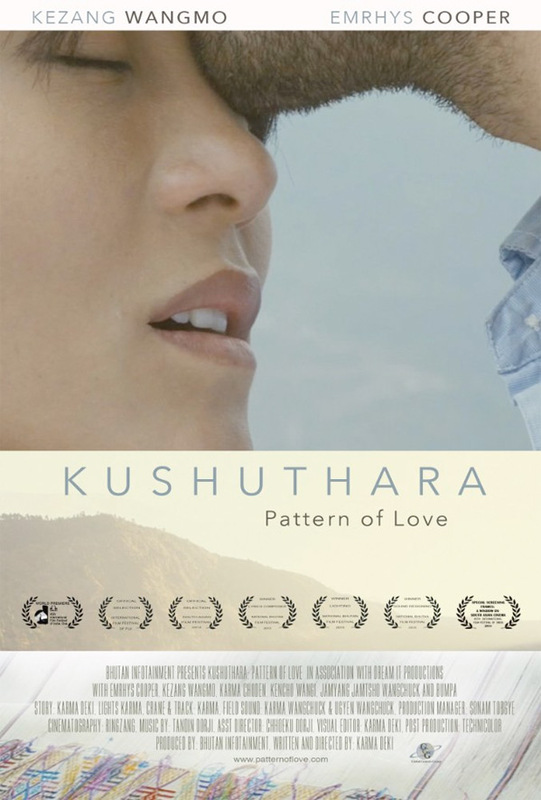 Kushurthara, which in Bhutanese means "love token woven in cloth", is the first film from Bhutan to star a western actor. The film is both written and directed by Bhutanese filmmaker Karma Deki, making her feature directorial debut after a short film previously. The film has played at the Los Angeles Independent Film Festival and Laughlin Film Festival. Kushuthara will be released in select theaters + on VOD starting this spring. An exact date is not set yet. Your thoughts? Had to be a White guy...LOL. For sure, it would be nice for those kinds of scenarios to be seen more on screen, but I have seen it time and time again, bogan/chavs running around with their little Asian dolls...Yes, it's a rude thing to say and no, not all Asian women get with bogans, but it just seems to stand out like a sore thumb when you see a muscle-head, singlet wearing chav, screaming at his partner and getting awkwardly physical. Seen this personally, in Singapore, Thailand, and Indonesia (Bali). // Sorry, that reads rather ranty. Personally, I'll be waiting until the Asian guy gets the White girl...and yeah, I'll keep waiting.